A program to manage GOES-ABI (Advanced Baseline Imager) data is under development, and is complementary to other my other satellite software such as GeoSatSignal (for multi-channel sensor combinations and projection remapping) and the MSG Animator (for simple single-channel animations). Currently the program supports GOES-16 (GOES-East) and GOES-17 (GOES-West). You need to register with EUMETSAT to receive the data over EUMETCast. Use the EO Portal to register. The data is sent on the new EUMETCast transponder, so you might require either a second EUMETCast receiver, or to configure a dual-input tuner to receive both transponder 1 and transponder 2 simultaneously. This is possible as both transponders have the same polarisation and are in the same frequency band. I have some notes on transponders here. Please see the current version of the GOES ABI Manager in my beta software page. It behaves like a simplified subset of my MSG Data Manager. Beta version: This program is under continual development - check here for the latest update. 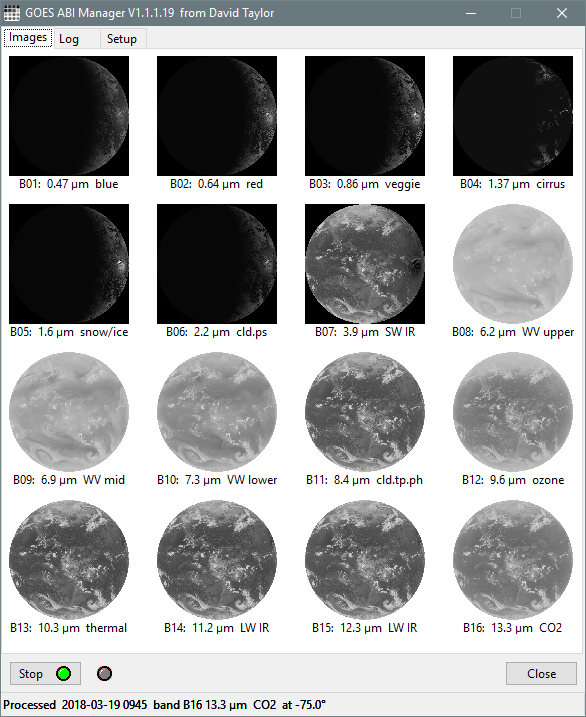 The Advanced Baseline Imager (ABI) on the Geostationary Operational Environmental Satellite (GOES)-R series has 16 spectral bands. Two bands are in the visible part of the electromagnetic spectrum, four are in the near-infrared, and ten are in the infrared. 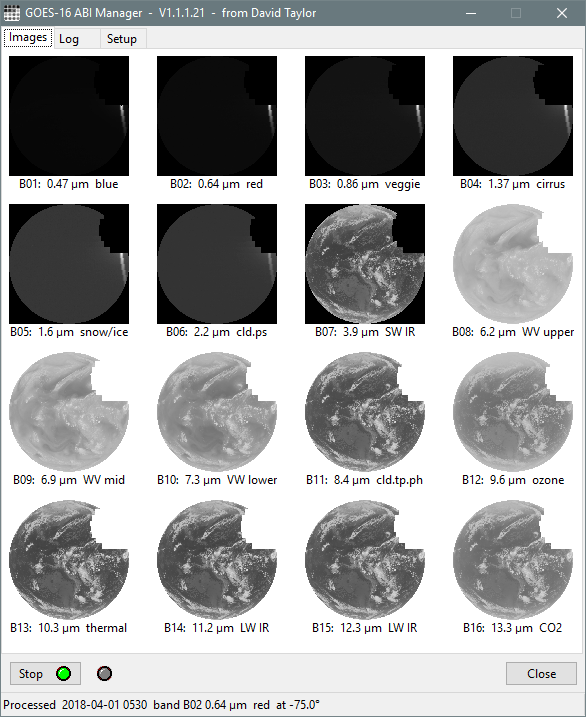 The ABI is similar to advanced geostationary imagers on other international satellite missions, such as the Advanced Himawari Imager (AHI) on Himawari-8 and -9. Operational meteorologists can investigate imagery from the ABI to better understand the state and evolution of the atmosphere. Various uses of the ABI spectral bands are described. GOES-R was launched on 19 November 2016 and became GOES-16 upon reaching geostationary orbit. GOES-16 is the first in a series of four spacecraft that will host ABI. GOES-16 became operational on 18 December 2017, in the GOES-East location. 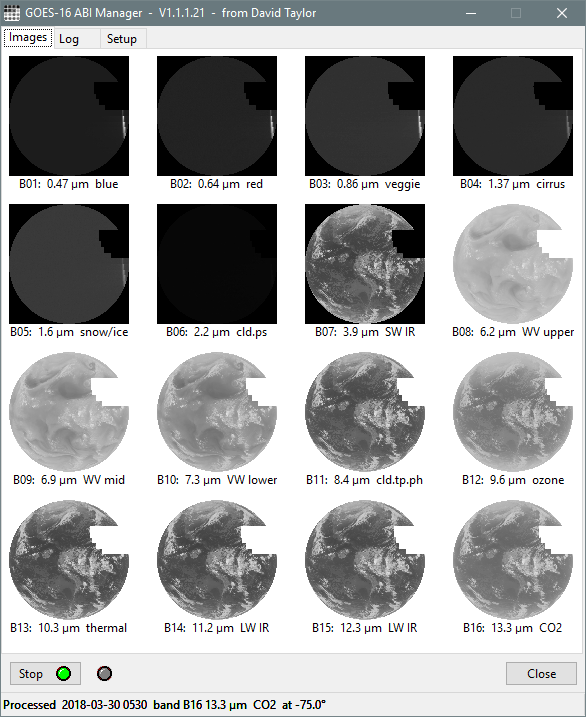 The ABI improvement is two orders of magnitude more than the legacy GOES imager due to more spectral bands and finer spatial and temporal resolutions. Strange image - bits missing? If you are seeing strange images around 05:00 UTC, like the one below, don't panic! It's around the local midnight time, and the scanner would see a direct view of the sun near the edge of the earth. This could damage the imager (just as your eye's retina or camera sensor could be damaged) so steps are taken to prevent this happening, while preserving as much of the rest of the image as possible.